To combat the effects of pressure and temperature fluctuations, flexibility and recovery are essential. Spiral wound gaskets (SWG) manufactured by Masterpac is the precision-engineered solution for flanged joints, heat exchangers, boiler handholes, manholes, and other high-temperature, high-pressure applications. We have different types of filler available at our factory which cover every requirement in each application e.g. Thermiculite®, Sigraflex® foil-C expanded graphite, PTFE. Conventional graphite gaskets are susceptible to attack by oxidising agents. This occurs from oxygen flowing with in the media, or simply from oxygen present in the atmosphere surrounding the flange. Thermiculite® 835 spiral wound gasket uses high temperature filler material which has max temperature to 982ºC (1800ºF) and Class 150 to 2500. Thermiculite® 835 is highly recommened for high temperature application. Masterpac SWG style ORWIR is recommended for high pressure/temperature applications. Both rings act as a compression limiter and provide protection from the process media at the same time. Typically used with flat face and raised face flanges and specified for high pressure and temperature service or where corrosive or toxic media are present. 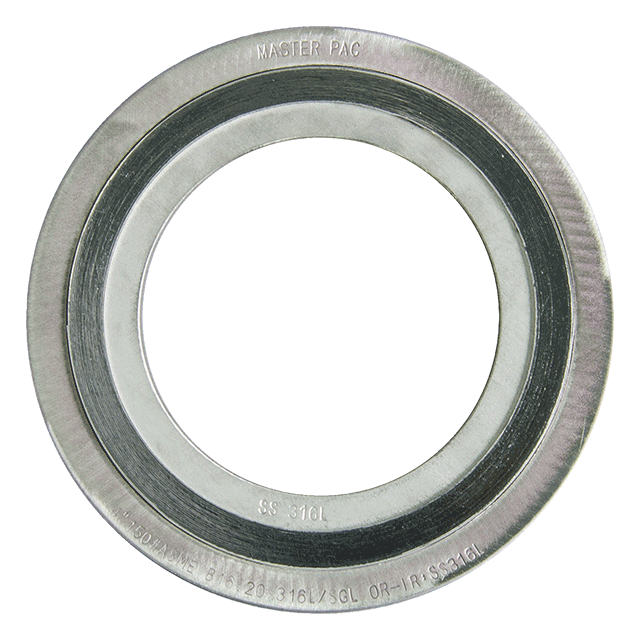 Masterpac SWG style ORW has an integral centering in order to assures fast and accurate centering of the gasket on the flange. It also acts as a compression limiter to prevent over compression of the winding. Typically suitable for using with flat face and raised face flanges. The major advantages of our SWG style WIR are protecting windings against media and pressure, reduce turbulent flow of process media, and minimize erosion of flange faces. Thank you to the Inner metal ring that acts as a compression stop and fills the annular space between flange bore and the inside diameter. Typically used for male-to-female pipe flanges. Masterpac SWG style winding-only (W) is the simplest style which consists of inner and outer diameters that reinforced with several “V” shaped metal strip. The major benefit of this design includes providing greater stability and better compression characteristics. Our SWG style W can be manufactured in different patterns including round, obround, oval, rectangle, diamond, pear and so on. Typically used in tongue & groove, male-to-female, groove-to-flat, and OEM applications.